Gerhard Parzutka von Lipinski, President of Nowa Scena sp. 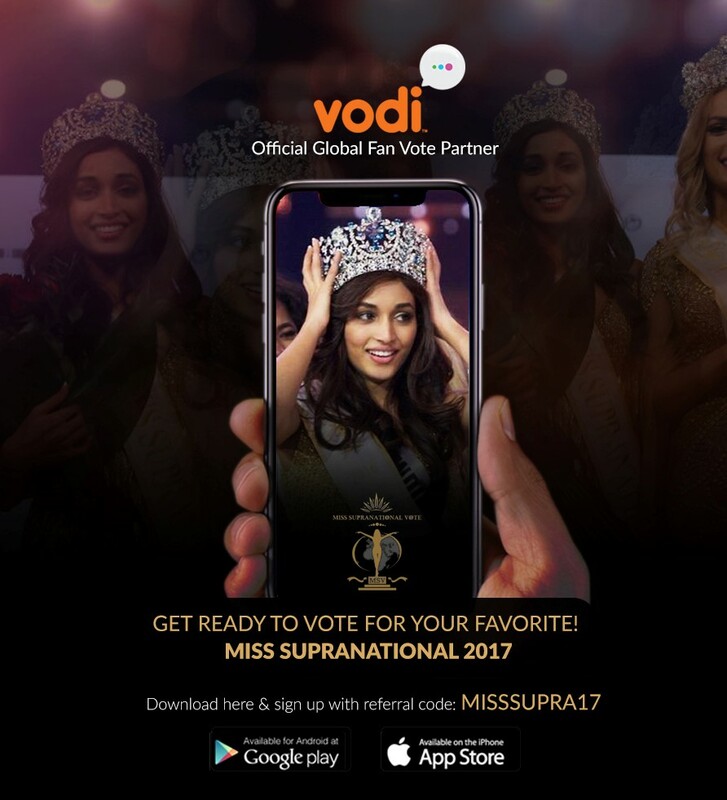 z o.o., announced today that the partnership with the popular mobile app, Vodi, as the Global Fan Vote Partner for Miss Supranational 2017 and Mister Supranational 2017 taking place this year in Poland and Slovakia. Accessing the platform to vote is as simple as selecting the “Voting” option within Vodi’s carousel menu, tapping on the desired event, choosing contestants for whom to vote and submitting their ballot. The winner of the overall fan vote will automatically advance to the final stages of their respective main events and the Organisation will be announcing the full details of the Public Voting in due course. Vodi is a global fintech and communication services app and an all-in-one mobile platform. It is a product of MilTec Platform, Inc., headquartered in Atlanta, Georgia (USA). Established in 2014, MilTec offers IT platforms and mobile applications. Vodi offers a host of financial products alongside vital communications features, launched its global interactive voting platform in January 2017 by serving as the Global Fan Vote Sponsor of Miss Universe. The app later partnered with Miss USA (May 2017) and Miss Panama (July and August 2017) to serve as a sponsor and voting platform, and this pioneering interactive service is available for all events from small, local competitions to massive international contests. Miss Supranational 2017 finals will take place on December 1st 2017 in the spa resort city of Krynica Zdroj, Poland. The reigning Miss Supranational, Srinidhi Shetty of India, will crown the 9th titleholder of Miss Supranational in an exciting evening of glamour, fashion and entertainment in the world’s most spectacular televised pageant. The first Miss Supranational competition began life in 2009 and was held in the beautiful city of Płock, Poland. The first ever group of contestants came from almost 40 countries around the world, Today after 9 years the number has doubled with competitors from every continent. Miss Supranational has developed into one of the world’s most prestigious live TV Shows. The honor of hosting this year returned to the city of Krynica –Zdrój in Poland. The show’s television audience has grown remarkably quickly and now rivals other pageants reaching a worldwide audience in more than 140 countries. Join us live on 1 December 2017 in Krynica-Zdrój, Poland and vote with VODI.